2018 was a remarkable year and we wanted to make sure we documented it well and shared it with everyone that's been a part of making it successful. So, we took the time to hire a writer, Kami Neff, and invited her to interview a handful of our "retirees" that provide significant capacity in terms of volunteer engagement and impact to the lives of those seeking assistance at NeighborLink. We combined her stories with the data from some of the most prominent highlights of 2018 and asked our graphic designer, Matt Plett, to turn the content into an annual report. In addition, we created videos to go with the report to bring a few of the stories to life like only video can do. You can view those videos and several others by clicking here. 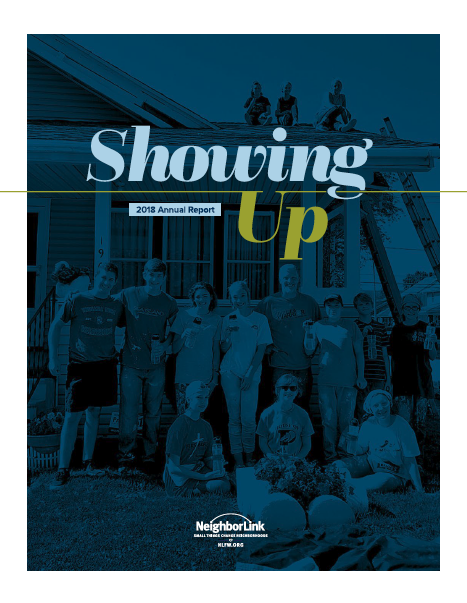 It is important for us to document all the Lord's blessings into a printed report as a testament to His work through NeighborLink, and to continue developing our ability to provide evidence that the resources our donors and volunteers are investing in our organization is making an impact for neighbors in need. Sharing the story is important to us and an annual report is a great tool to do so. We look forward to making this a regular rhythm at NeighborLink for years to come. By clicking the link below, you can download a PDF of the report. If you would like a printed copy mailed to your home, we'd love to do that. Simply send an email with your mailing information to Andrew@nlfw.org and he'll get one in the mail.